Any break is routine is always welcome. Like Saturday’s. More than a month ago I seem to have injured my left leg having started running cold. I had it massaged once but the pain seems to linger although not as much. My wife suspects it’s something to do with uric acidicity, I think it’s about my 10 pounds excess weight. So yesterday I had it massaged again this time in a place that reminds me of no spa but of my old bed space days. Surprisingly, my co-worker who moonlights as a massage therapist can do better service than most I’ve had. Hope to get back to running again in a few weeks. This week I am due to pay my monthly gym membership fee but I’m passing up on it. I have been thinking about discontinuing my payment since October but the main reason that would make me finally cease from taking that 10-minute walk from home has not happened even until now. This time, however, I have decided to save my P500 whether I like it or not. It is true that going to the gym is addictive, I can attest to that. Like any other gym rats, I discovered that sense of pride and the accompanying high I get, thanks to endorphins, even just after an hour of intense workout. To conquer that next dumbbell in the row is always rewarding and it progresses to the start of a new goal–heavier weight, you’re next. Going to the gym was never a thing for me. I hate competing with anyone else, more so tolerate the thought of having to deal with, and the sight of, people who loiter and spend time doing anything but workout–like those excessively staring in the mirror and taking selfies all day. Thankfully, a change in mindset made me overcome this pet peeve. The gym I realized is where my focus is tested, where I compete with myself rather than against the others. But could I still workout if I stop going to the gym? The only gym pic I ever had. Questions I have in mind about other options in staying physically fit sans the machines were answered by one of the few books I purchased on Amazon using my almost maxed out credit card. Strength Rules by Danny Kavadlo provides fresh insights on plain body weight training. It opens new potentials of what anyone could achieve without using any complicated equipment and costly gym membership. Dan’s only requirements are the following: something to step up on, something to hang from, and one that’s readily available, something heavy, which, if you still don’t recognize yet, is our own body. Danny Kavadlo reminds us that our body is a workout equipment if we know how to use it and how to keep it running. He stresses the importance of natural food over artificial supplements that one I have eliminated sooner (whey protein) and the other I have never bought (creatine). I used to take whey protein regularly but budget and having egg and chicken breast fillet as alternatives—not to mention good sources of natural protein—made me stop buying another 2.2 lbs more of my then favorite workout shake. As Danny says, “Eat muscle to build muscle.” That’s chicken and beef meat. Plain and simple. There are more things to like about Strength Rules. Danny Kavadlo does not have sets of exercises that he wants to be followed by the number. In fact, he encourages his readers to perform whatever is possible at the moment. He does not believe that a strict routine should be adhered to for one to attain his or her personal fitness goals. This book is also ideal for those who are tired of fad diets that were neither sustainable nor practical for most. His take on this? ”Should you have three big meals a day or six small ones? Who cares? Eat when you’re hungry and stop when you’re full. Don’t overthink.” Again, natural foods such as apples and banana only please, so forget about that tempting granola or protein bar as these are not only expensive but full of sugar as well that could negate all the efforts we make to trim down and stay healthy. Strength Rules is available on Amazon and costs about P400 which I consider a worthy expense. The book has 2100 plus locations with pictures and illustrations that improve comprehension of the variety of exercises that revolve around the basic squat, push, and pull. Until when I would have my layoff from the gym workout I really can’t tell. Whether it will be temporary or not, remains to be seen as I am looking forward to test myself against plain body weight training. My routine in the next months would change but the main goal why I wake up to go to the gym stays the same: be fit for Marcus, be the muscle for him. Wish me luck. 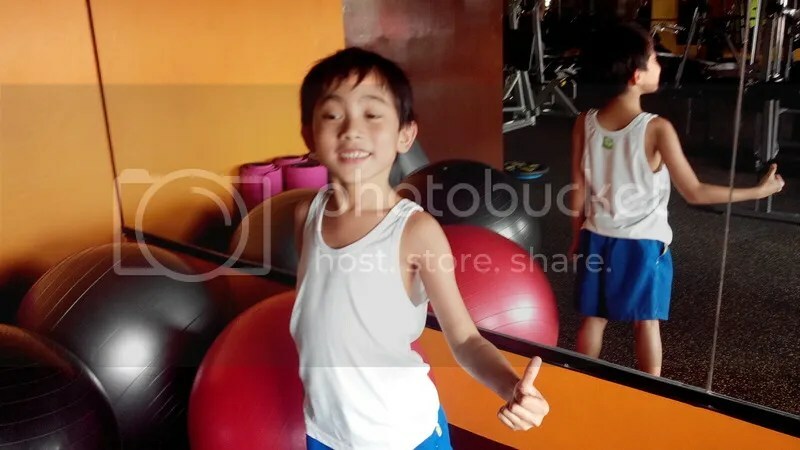 He wants to see the gym so we dropped by right after his class. Taken a month before he finally said he can’t go to school anymore. The gym will be one of the very few places I will miss in Dasma. I like Christmas but I have been anti-Christmas tree. This year I survived another begging from wifey to buy one as, to reiterate same statement I say every year, I find it a waste of money and that I would feel guilty staring at a new Christmas tree when I could have used it for charity or something more important. I am no Grinch, however. (This is where I expect to see people, including wifey, raise their eyebrows.) I don’t sneak into Christmas trees and secretly breaks it. I am a kid at heart whenever I see the sight of Christmas trees at the malls and someone other houses. I am just not ready, nor could afford, to buy our own. It does not mean though that I couldn’t or wouldn’t build one. In fact, wifey and I made one again. 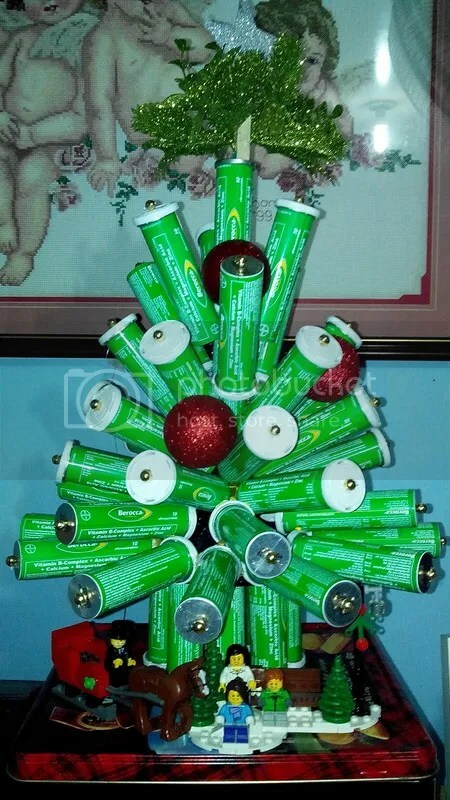 Thanks to the stash of empty Berocca–more than a year’s worth–canisters I kept up the ceiling a new Christmas tree is born. The past years we built one made of badminton shuttlecocks which we used for more than three Decembers. I love Berocca that I find it hard to throw even the empty canisters. We must always remember that Christmas will always be Christmas with or without a Christmas tree. There are always ways to feel the spirit of the yuletide season and the more we understand that it should come from within and shared with the others the better it will be. It takes a glue stick, some creativity and a patient wifey. Early this year I stopped using Berocca to try out two products being endorsed, forced may be appropriate, by wifey. 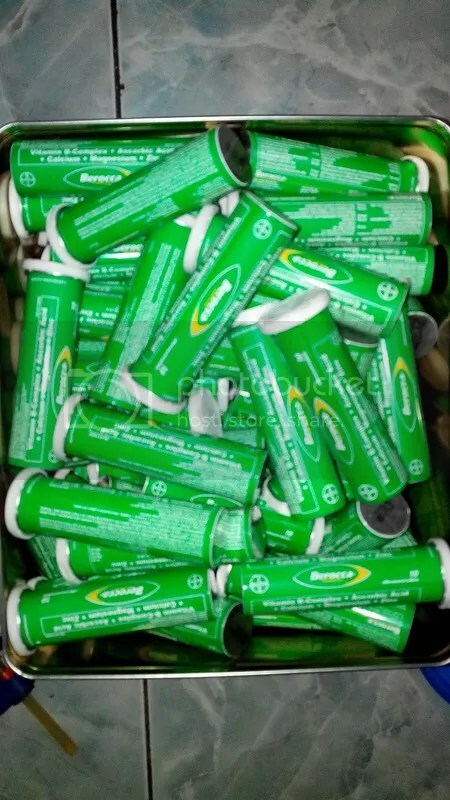 Berocca was something hard to let go as I personally find it an effective supplement so I had hesitations welcoming Royale’s Spirulina and Performax into my routine. We even had to compare side by side the content of Berocca versus Spirulina and based on supplement facts Berocca wins. Anyway, to cut the story short, I gave Spirulina plus Performax a try and surprisingly I adapted to it. I use Performax when I go to the gym and I can attest to its potency. On top of my other routines I can now do two sets each of 50-lbs dumbbell flat and incline press. Placebo? Who cares. It’s eight more days before our diet will be tested and fifteen more days before we realize our resolution to lose weight has failed. There is always yin and yang, there is–or should be–always balance. This is the message that I realized from just two simple stickers. 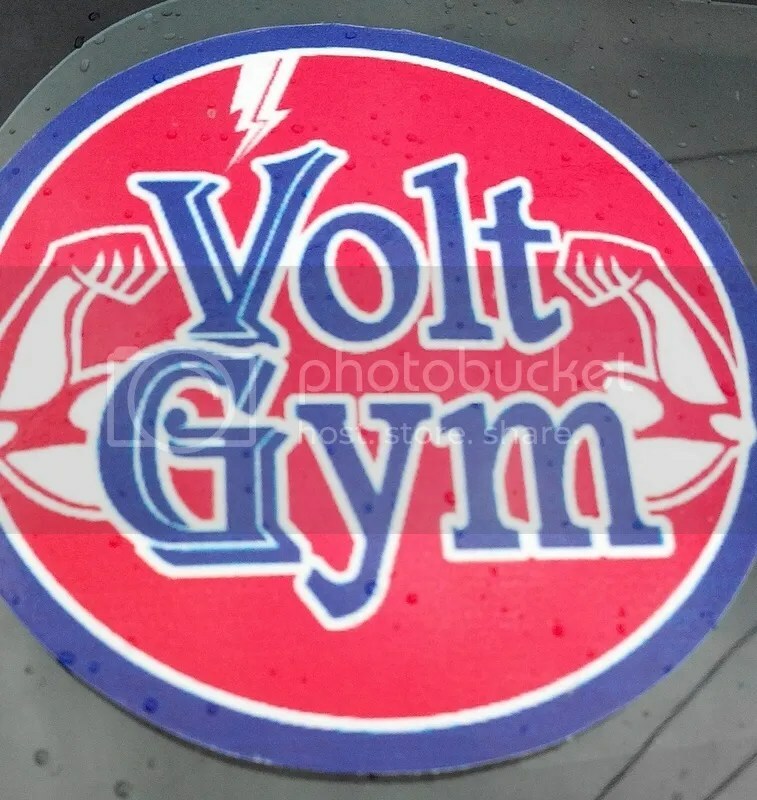 Unexpectedly, after I was done with my workout this morning the attendant gave me their gym sticker. 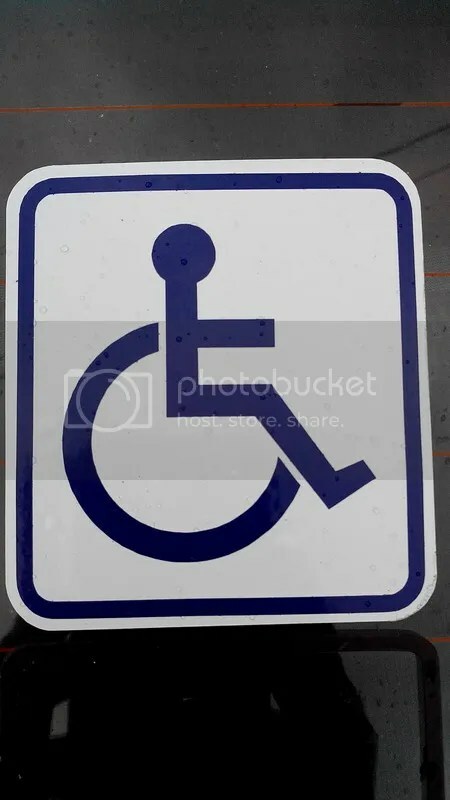 This surely will cause some raised eyebrows at the parking area but I’m sticking it anyway. So yes, simple things could remind us that there is yin and yang. Life is balanced. Life has opposites. Sadness and happiness. Sickness and health. Father and son. Life and death. Oppss. My avid readers–all five of them–said that my recent posts have been dark and sad so I’m striking out the last juxtaposition. Cheers. Discovered today that I can run on the treadmill and read an ebook at the same time. Had an interesting 5K, thanks to Angela Marson’s Silent Scream. Yes, been a fan lately of discounted Kindle books. Are Tablets Good for Children? April 23, Thursday. We were in a developmental pediatrician’s clinic. Our main purpose that day was to have Marcus checked for his unexplained frailty–he falls, he trips for no apparent reason. 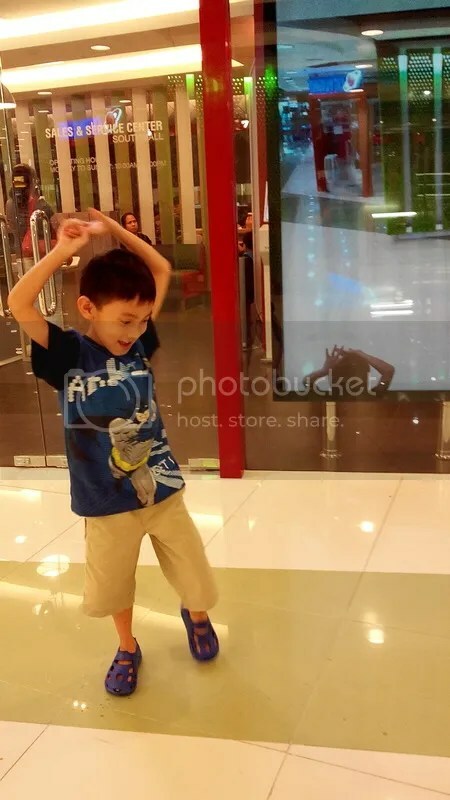 And among the factors we believed that contribute to his abnormal condition is just his lack of physical activities compared with other children of his age. Immediately after being checked by the doctor, Marcus went to his cousin who is seated just across the doctor’s desk. Jed was occupied with Minecraft (they have been playing this game most of the time since day one of Jed’s one-week vacation) on our PLDT Telpad. They were quiet–as I have advised them–but the gadget captured the doctor’s attention. We didn’t expect what she said next. “Were you ever aware about the effect of that gadget to your kid?” the doctor asked. “We’ll I’ve read about it,” I replied defensively. Obviously, she has a lot more to say about it, she went on with her lecture. According to her, these gadgets impact our children big time. Kids nowadays who start to learn, some as young as six months old, how to use smartphones and tablets exhibit at least one of the following characteristics: impatience, short attention span, excessively possessive, and snaps easily. She added that electronic gadgets have been observed to cause ADHD and even trigger autism. While she was spot on regarding the characteristics–it was everything we have observed from Marcus, I was skeptic about ADHD and autism. Nevertheless I swear that day that there will be lesser gadget time for Marcus. I felt more convinced that he needs to get more physical activity. I thought it was time to pump his green bike back to life. But it was a plan that would change quickly the following day. Are smartphones and tablets good for children then? Given the effects of these gadgets, would we want to keep our kids away from them? Of course, this where parenting comes in. The key here is appropriate control as well as being good role models. Parents must also have the awareness that different kids have different needs which for my wife and I right now is the most important thing. After April 23 we are back to allowing Marcus to have more gadget time. My wife and I have agreed that we will not force him anymore to get engaged in physical activities. We will let him play Minecraft more where he can build his own world and move around any terrain without falling down, without getting hurt. The doctor won’t probably understand but hopefully someday she will. Author crisnPosted on May 9, 2015 Categories ParentingTags #LiftMarcus, Health, TechnologyLeave a comment on Are Tablets Good for Children? There are things happening around us that we tend to ignore and it is perfectly normal. We only care if something affects us–the economy, gadgets, car models, fashion, entertainment, career, etc. In our health-conscious world, we also would talk about fitness in general. Everyone considers activities like going to the gym, start running, and acquiring that first bike. The concerns of the average Joes, at the very least. If you belong to this crowd, then you are lucky. It means that you are gifted with a sound mind and body that allows you to be involved in normal physical activities. But not everyone can be physically active, let alone do simple tasks. For some people, simply standing up or talking small steps are challenging enough. 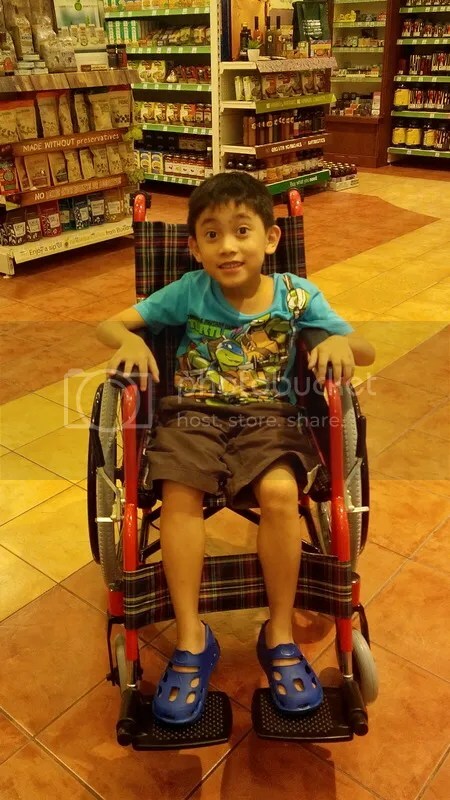 Like children with muscular dystrophy, specifically Duchenne Muscular Dystrophy or DMD. Children with DMD are innocent victims of a genetic disorder. According to online resources, DMD is caused by a damaged or mutated dystrophin gene on the X chromosomes resulting to the muscles not to develop properly and, worse, to degrade over time. DMD will cripple anyone at a very young age. So what if science can correct this problem? What if there is a way to edit the genetic code so that a normal baby comes out. Would you approve? Do you think God will approve? Yes, there will always be questions regarding the ethics of tweaking the genes. Lots of it actually. The fear of having only perfect babies will always linger. The thought about something similar to the Nazi’s genocide happening all over again or even imagine the fictional movie Gattaca becoming real would surface. Will this breakthrough eventually result to inhumane elimination of the weak and anyone with inferior genes? What a scary thought, right? There are chances though that some are willing to take. These are the people who are in this situation. Those who are, and their loved ones, inflicted with a disorder that science currently have not resolved. They are people who are the intended beneficiaries of the cure that are still in the works. They are the ones who, while scientists experiment with animals and while lawmakers debate on ethics, continue to suffer and with time working against them. It won’t be a big surprise though to learn that not everyone will agree to embryo editing. For one, this may contradict religious beliefs as it could be seen as playing God. There will always be people who would not want to oppose the will of God. There are people who believe in nothing but divine miracles. But what if embryo editing is the miracle that we have been waiting for? For me, this is a miracle. It may be selfish for me to wish Marcus could have avoided DMD, as the doctor has recently diagnosed, had embryo editing been available before and to not think about the long-term impact of the technology in case some scientists dare to push the envelop. We are that desperate right now and our immediate concern is for a cure to ultimately produce healthy babies as well as cure those with genetic disorder so that they could be just like most of us, regular Joes.